Not according to Jerry Brown, who is a founding father of the tax-cuts-for-most-people New Democrats. UC online is the "smallish government" party's idea of a public university. Another piece of the answer for Gov. Brown's enthusiasm for online Public Us is that he is fine with privatization, where public services are pushed off the public books by being given to private agencies. A local Santa Barbara story about city parking lots offers an illustration. The City of Santa Barbara set up a state-backed Redevelopment Agency (RDA) to build, along with parks and affordable housing, parking lots in the center of town. It used California Redevelopment Agency legislation first passed in 1945, which allowed governments to "use a portion of property tax money to partner with developers to encourage development in blighted areas . . .After agencies repay their existing bonds, those revenues . . . go instead to schools and special districts." Last year, Gov. Brown pushed for the total elimination of all 420 RDAs in order to save money the state budget, and he succeeded. He also overcame a court challenge (the citation above is from the Los Angeles Times report on the judge's decision in that law suit). The argument against RDAs was that they were an expensive use public money to subsidize projects that enriched private developers but did little for their local areas. In Santa Barbara, most assets were transferred without trouble, but not the lots. Since the 1960s, the City of Santa Barbara has sought to provide cheap and easily available parking to encourage shoppers to come downtown and keep the central business district economically healthy. Since the 1970s, the city’s Redevelopment Agency spent millions to that end as part of a sustained effort lasting 40 years. After that agency was forced to dissolve earlier this year ​— ​as part of the legislative response to California’s ongoing budget crisis ​— ​the city sought to transfer the parking lots to City Hall itself. In an update on January 3rd (not on line), Welsh detailed those objections from Gov. Brown's Department of Finance. The parking lots, DOF wrote, do not constitute "a legitimate government function." They would qualify for this status only if the lots "were exclusively occupied by City Hall employees." Since they are mostly occupied by the public, the DOF demand is that the parking lots, though built with public funds, be put up for auction and sold, undoubtedly to private companies. Private owners are unlikely to continue the free-then-low-cost parking policy. This past summer, the department got language included in a bill that would have precluded any municipal government from taking possession of former RDA assets unless it passed the 'legitimate government function" test. [And] that bill specifically barred city parking lots from consideration. Although its legislation failed, DOF continues to try to enforce this interpretation, and the City of Santa Barbara happens to be the "first California city to confront this question." The legislation spelled out two elements of the thinking lying behind the Brown Administration's cost-cutting efforts. First, "legitimate government functions" do not include public uses that sustain community development. Second, public assets can and should be sold to private interests. In the world of parking lots, that would mean selling them to a private entity like those once controlled by developer Rick Caruso. Caruso, as Welsh explains, made his initial fortune in private parking lots in Los Angeles. Caruso is now the owner of Montecito's Miramar Hotel, a property that had been an affordable beach motel from the late 19th century, was closed in 2000 by its first mogul purchaser, Ian Schrager of Studio 54 fame, and which a series of mogul owners has over the past 12 years never managed to reopen. Caruso has spent his Miramar time extracting a 15 year county tax abatment in exchange for actually tearing down the buildings that have sat half-demolished for a decade. Consruction of a new hotel on this beachfront property is still off in the future. Brown-style Democrats often use public money not to develop society directly but to subsidize the allegedly parallel efforts of private interests. The result with the Miramar hotel is low- and middle-income people losing a beach hotel they could afford, and instead paying for tax breaks for a possible future hotel that they cannot. The same thing will happen if the city lots are auctioned to Caruso-style parking companies. Which brings us back to MOOCed universities. Teaching technology is nothing new on college campuses, and "distance learning" is quite old. Here's an Ansel Adams photograph of a chemistry lecture being sent elsewhere. 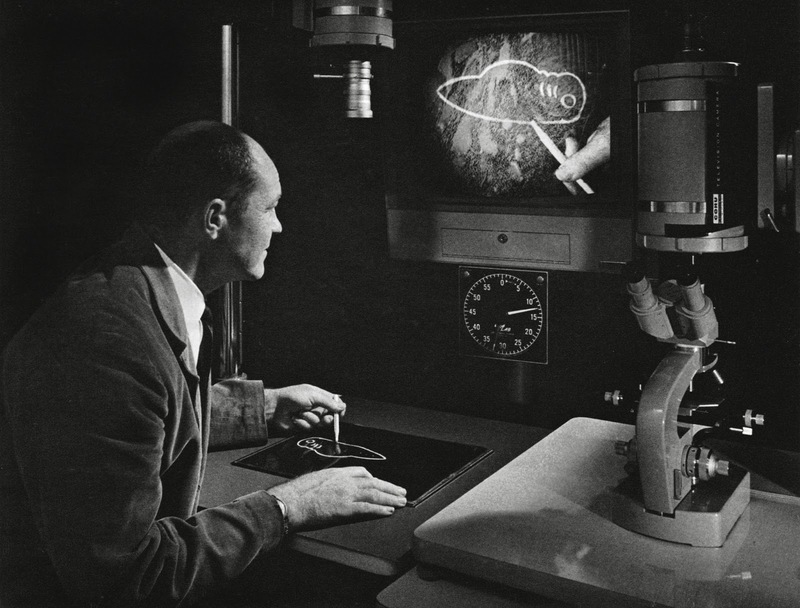 This is UCSB professor Edward L. Tripplett conducting "televised instruction," circa 1966. What IS new then? The technology has obviously improved, even if the concepts have not. In addition, the current "honey I shrunk the budget" UC doesn't have money for tech upgrades that can compete with start-ups funded by wealthy private universities, in the case of edX, or by venture capitalists, in the cases of Udacity and Coursera. Finally, MOOC technology would be coming from private startups rather than from the faculty, staff, and students who use it (and who in some cases invented it). Provders say this will cut costs. We have quite a bit of experience that allows us to assess whether this is true. The argument is always that privatization of public goods saves money. Like HMOs have saved Americans a pile of money in health care. Or like the privatization of British Rail improved service at a lower price. Like selling academic journals to private publishing conglomerates has made the results of publicly funded research widely accessible to the public. Like the UK Cameron government's massive cuts to English and Welsh universities have improved college quality while lowering costs . . . These things may have happened somewhere, but not on this planet. The US health care system is 2.5 times more expensive than the nearest competitor for inferior overall outcomes. A UK Treasury study of "private financing initiatives" showed they typically added 40% to the cost of public services. Academic publisher Elsevier's 37% profit margins are a big reason why its articles cost 8 times more apiece than do their open source equivalents. And of course the Cameron government's massive cut to British universities resulted in an immediate, nearly-universal tripling of fees and a likely increase of 100 billion pounds to public debt. Jerry Brown's November intervention at the Regents' meeting will be followed by a presentation about online to the Regents's Committee on Educational Policy on January 16th. The agenda is not yet public, but if precedent serves, the ideas will be coming 100% from outside providers and 0% from UC faculty, even when that faculty includes figures like UC Berkeley Professor Phillip Stark with a lifetime of experience in online instruction. UCLA is hosting a prequel to the Regents' meeting, in the form of a day-long gala called "Rebooting California Higher Education." The subtitle is "leveraging innovations in online education to improve cost effectiveness and increase quality." The day offers a number of prominent speakers --Candace Thille is a lead developer of Carnegie Mellon's Open Learning Initiative, which is arguably the online gold standard, and Udacity co-founder Sebastian Thrun is an excellent online instructor, which I know because I am enrolled in his Udacity statistics course. But form (and political connections) are likely to dictate content. The title reflects the absurd premise of most ed-tech proselytizing, which is that higher ed is currently frozen, or off, or stuck in an infinite loop where nobody is scrambling to increase efficiency or quality. The sponsoring organization has one of those pretentious names, 20 Million Minds, designed to make public universities seem small and elitist. It is a micro-organization founded by the former President Pro Tem of the California State Senate, Dean Florez, and its event is introduced by Darrell Steinberg, the current President Pro Tem of the California State Senate. Florez was behind the free textbook library created by legislation signed by Jerry Brown. The event appears to concretize a power structure rather than probe the weaknesses as well as the strengths of the solution it announces in its title. If we aren't careful, privatization history will repeat itself, and UC in its desperation will invite on board a host of outside service providers who will have a seat at the curriculum table and a claim on a piece of UC's shrinking revenues. (A figure I have heard is that the provider takes 50% of the first seven years' revenues on each course it develops.) Without contrary proof, I will assume that these providers would lower higher ed costs for all Californians to the same extent that Rick Caruso would offer free parking for Santa Barbara civic life. The least we can ask of these industry efforts to redefine public higher ed is that they provide concrete accounting for future costs and specific descriptions of their unique educational benefits, and not the usual empty assurances. Discussions of UC and online "quality" never seem to define it or say how to measure it. I've started asking graduates what they got from their undergrad education. So far, in order, it's "credential", "made friends with bright people", "learned to write well" (mainly because of practice, not feedback), "learned I could handle bigger challenges than I thought (going abroad especially important), "found role models" (good lecturing far less important than answering questions or adding to discussion in small groups). Course material was, well, immaterial, or nearly so. To me this suggests (a) we faculty need to think hard about our aims, and (b) online ed leaves out most - nearly all - of the true value of university ed. Depressing and accurate. 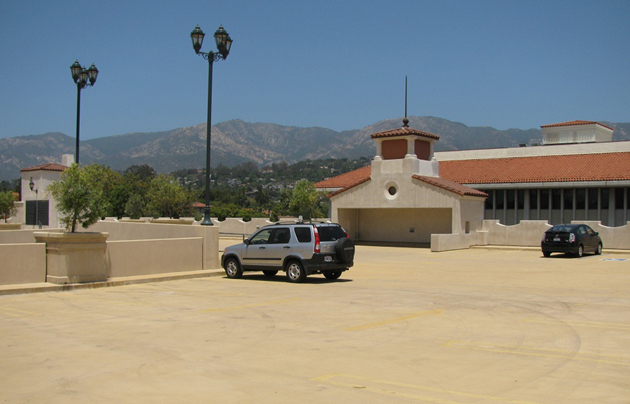 Re parking lots, Santa Barbara's downtown vitality has a lot to do with municipal parking lots and structures, funded in part by fees paid by downtown businesses (the fees are based on revenues and distance from the parking lot), which provide 75 minutes of free parking, and modest charges after that. These must be sold off to private developers? Go figure. Chris is right - we need an alternative to the Democratic party as it has morphed into its anti-government form. Regarding trying to define educational quality: maybe we need to define what "education" is first. I just read a thought-provoking line in an editorial in the AFT's newsletter "On Campus" (Jan/Feb. 2013): "... how we define education: Is it the *process* of teaching and learning ...? Or is it the *product* represented by a credential, a certificate of completion, a diploma?" Author Cynthia Eaton doesn't even consider mastering content or the classical definition of drawing out meaning from that content.